The best thing about running this site is the opportunity to get to know and share the work of promising new writers from Venezuela. One such young talent is Saúl Figueredo (Caracas, 1995). At just 18 years old, this aspiring writer and sociology student at UCV shows impressive maturity in his short stories, like Casitas de luces, a fantastical evocation of the contradictions of Caracas. The boy watched the thousands of yellow and white lights (which seemed more blue than white) in the distance with astonishment and admiration. From the balcony of his house, he would linger every night watching the beautiful far-off lights in the easternmost part of the city. In the jumbled lights of the mountain he saw what the polluted sky couldn’t give him, he saw stars, enormous and disordered constellations that shaped for his young mind what a galaxy ought to be. The night lights gave him the feeling that the Earth and space were mixed and that, in that moment, although distant, he could go to other worlds and explore the universe. The lights also brought him the wonder of Christmas, where everything is sparkle and shine, everything is beautiful and his childish innocence can flourish: the lights on the mountain remind him of a giant Christmas tree. The foreigner who arrived by plane in this unknown land for the first time was also left spellbound by the spectacle of the lights that greeted him. He didn’t know much about this place, didn’t share the language nor know much about the history. He had been sent for work reasons to meet the managers of a company who were still based there. The man knew from general knowledge (and also something of prejudice) that it was a place with great poverty and quite a marked distinction between classes. He had been warned, moreover, about the levels of insecurity, so the foreigner couldn’t help feeling a little scared about his work mission. But looking out of the window, he didn’t notice any of this, he only saw the lights that welcomed him warmly, lights which could in no way harm him. He was met by a driver sent by the company, who had to take him without delay to the hotel where he would be staying. Ten minutes into the journey and tiredness was gaining ground. Along the mountain motorways he could make out some of the lights and admired them through half-open eyes. He let himself be wrapped up in those magical lights, without thinking about their real nature. The foreigner, who arrived at night exhausted, could not imagine that the lights were really city sirens, that at night and from afar they were enchanting but that within them there could be enough horror for a lifetime. It had finally arrived, it was finally 31st December, the most eagerly anticipated night for the boy on the balcony. He knew that many families would go up to the high points with good views to admire the fireworks and the city lights, but he didn’t need to move. His house was on one of the highest hillsides in the city, he lived in a luxurious mansion, fruit of his parents’ labour, from where you could see the whole city, all the lights and all the fireworks. Every New Year’s Eve, his whole family would get together in the house, eat, some would get drunk, some danced, and as midnight approached, all of them, with a glass of champagne in hand, would gather on the balcony to watch the fireworks and set off some of their own. His mother always bothered him to play with the other children who came to the house for the occasion, mainly annoying cousins who always wanted to do something that he didn’t want to do. They loved to run around and play hide and seek, but he wasn’t very good at these games, he wasn’t very fast and, despite being skilled at hiding, if too much time passed without him being found he would get scared and come out of his cave, and in that exact moment would be spotted and lose the game. He was aware that he was a strange boy, he was clever enough to notice that there were few people who shared his interests and lots of people who shared interests in things that seemed tedious to him. For that reason he decided not to obey his mother any longer and let his cousins play on their own, on the condition that they left him in peace while he, sitting out on the balcony, contemplated the universe of the city lights. The foreigner woke up to the voice of the driver advising him that they had arrived at the hotel. He was a bit disconcerted, as if he didn’t quite know where he was, and slightly worried about not having paid attention to the way there, but because he was so tired he decided to go straight to bed and tomorrow he would ask the driver to give him a little tour. When he got to his room, the first thing he did was completely empty his suitcase. He hadn’t brought very much, nor anything particularly important. He put the clothes in the closet. He had brought three books with him, which he put on a shelf. He placed his computer on the desk and his toiletries went in the bathroom. Although he didn’t take more than ten minutes doing this, because of his previous tiredness, it felt like a titanic task from which he emerged completely exhausted. He threw himself onto the bed and immediately fell down the rabbit hole. He dreamed that he was driving a very small spaceship, with barely enough space for two people, but there was nobody in the seat next to him. He flew around seeing infinite stars on all sides, which amazed him intensely. He saw planets of different shapes, different colours and sizes, and all the while the stars around him didn’t stop, there seemed to be more and more. He then entered one of these planets, which was green and blue like his own, but he knew that it wasn’t his, it was much bigger. He passed through unending forests and seas that he crossed in just seconds in his spaceship while more and more stars appeared around him, increasingly close. He entered a colossal sea that seemed to have no end, he saw hundreds of sea-creatures which he knew did not exist in his world and it was there that he heard the beautiful singing. The sublime voice of the most beautiful woman he had ever seen, she called to him, while the stars drew nearer, he got out of his spaceship and walked without difficulty through the water, while the stars drew nearer, the woman came closer and closer, soon he would be able to grasp her, soon he would have her, the stars burned them, but he didn’t feel it, as he was completely bewitched by love. He touched her, embraced her, and she played along, still singing, now in his ear, soon she told him to kiss her and he obeyed her request without delay. The moment of the kiss was sublime, he felt like a being beyond time, lord of the cosmos, creator of infinite labyrinths and father of the stars, which were now so close that they embraced him. The moment was an eternal second, and it was enough not to notice or care what happened next. The woman was slowly devouring him without him realising, until she swallowed him completely, and the stars, now part of them, consumed her and him inside her, leaving nothing apart from the blazing light and infernal heat of the nearby star. Now it was him inside of her inside of the star. He woke up bewildered and at that very moment the telephone rang, his driver calling. Finally it was the moment, the boy was at the front, leaning on the railings of the balcony, witnessing the beauty of the fireworks and the lights. Fireworks of all colours and shapes that exploded making booming sounds that filled him with wonder. The city was slowly filling with a dense fog caused by the smoke from the rockets and at this point, because of the noises and the lights that appeared behind the curtain of mist, the boy imagined that the city was being invaded, that we found ourselves at war and that the invaders had taken advantage of the New Year’s Eve celebrations to catch us unawares. This game distracted him a long while, but then he returned to simply contemplating the whole spectacle, a collective show that the whole universe participated in, when from the lights of the mountain galaxy to the East, to the other extreme where there was another galaxy, passing by the centre (which was his city), everyone agreed to launch fireworks and pay homage to the stars trying to imitate their brightness and colour. The child slept with a feeling of peace and happiness that few things could afford him. You could not say the same about when he woke up. When the morning of 1st January arrived, the boy was filled with despair because he would have to wait a whole year for his favourite night and a year for a boy is little short of infinity. The day, moreover, brought him back to reality, during the day the Earth wasn’t mixed with space, as there was a large layer of blue in the way. During the day the far away land of the lights disappeared and coloured houses with zinc roofs appeared, he didn’t know how this happened, but somehow the transition from day to night transformed everything. During the day, his father constantly warned him about these little brick houses, telling him about how dangerous they were. He was told (not only by his father) that there people robbed, kidnapped and killed, among other things. Words that weren’t meant for the ears of a child, but which were sadly part of his reality and he had to know them to be able to avoid them. That’s what the day brought; it brought reality, cold and cruel reality. The driver would come to collect him in an hour and a half, so he had time to have breakfast and read a little. When the waiter came to take his order, he brought him the local paper, of which the foreigner didn’t understand one word, but before he could give it back, he saw an image which caught his eye. The front page showed a panoramic photo of the city which included the barrios of lights, all bathed in fireworks. The story was from a few days ago, from New Year’s Eve. He asked the waiter to please tell him what the article said and in mangled English the waiter translated the title for him: “More than 40 deaths on New Year’s Eve”. The foreigner was horrified and couldn’t finish his breakfast. The driver came to get him, he spoke good English, the company had made sure that they could communicate, the foreigner asked him about the news and the driver replied in a humdrum way that that is the reality of the country. They did a tour of the best parts of the city. They passed through the commercial zones where the best shops and the best restaurants were to be found. They passed by parks and handsomely made squares in which it would be nice to sit and read or simply think and contemplate this beautiful part of the city. At lunchtime the driver took him to one of the most famous restaurants in the city and as he didn’t have any other friend here the foreigner invited the driver to eat with him. They spoke about a little of everything, about football, as they were both fanatics, each one telling anecdotes of football victories and defeats from his own country, then they moved on to politics and the driver told him about the current situation in the country and the horrified foreigner compared it with that of his own home. On the journey back, the foreigner asked about the famous neighbourhoods which boasted the beautiful lights that had even managed to invade his dreams. The driver laughed when he heard this and replied that it was better to avoid them. They stopped at a red light, everything was over so quickly, he doesn’t know when or how the driver ended up with a bullet in the head, surely from the driver who had been in front. In the blink of an eye two men grabbed him and dragged him roughly towards somewhere, he didn’t put up resistance, he simply didn’t know what was going on, everything was over so quickly, they put something over his head and everything went dark. Back in his bubble, the boy read quietly in his house. At around six o’clock his father, very shaken, goes straight to the kitchen to make tea and call his wife. 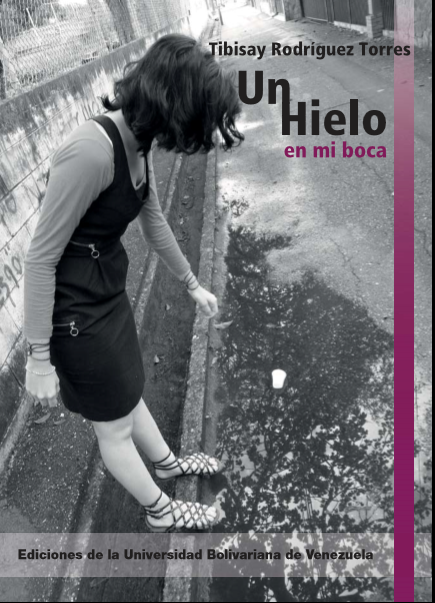 He tells her that he witnessed, in broad daylight and in the middle of León Avenue, an assassination and a kidnapping, just two cars ahead of him. He stammers something about how this country is going to hell and other things that the boy could not make out and turns on the television which is showing the same thing it shows every day, people moaning about their living conditions, a news report about some assassination, a report about the kidnapping of some foreigner and his embassy’s indignation, the allegations of corruption against the government by an opposing group, and the allegations by the government against the opposing group. All these television programmes, that clearly no child should have to watch, made the boy sick, didn’t let him read and caused him a terrible anxiety as well as an internal humming which he couldn’t explain, but his father seemed immune to this. Every time that he asked him to please turn off the television or change the channel, his father replied that he was still a child and didn’t understand anything about what was happening. Then the boy would silently start his nightly ritual, escaping onto the balcony and watching how his whole reality slowly melted away and formed a continuous landscape with the rest of the cosmos, on the horizon he could see everything that was, is and will be. He saw the lights and knew that they had nothing to do with the little coloured houses with concrete and zinc roofs in which so many atrocious crimes occurred. The sound of the TV would fade little by little until it disappeared and nothing was left from this sick and evil world, just him and the lights of the universe. The foreigner awoke with a start. He found himself on the roof of a house just like all the others that made up a sea of homogeneous houses on a hill that lost all of its green years ago. It seemed ironic to him that in his direct eye line, not very far away, he could see a complex of luxury buildings surrounded by a high wall and strong security. This wall was the only thing that separated the two sides of the coin, bordering each other. Next to him were four men who looked at him with unparalleled hatred and he asked himself why they hated him if he had never seen them before, if he wasn’t even from this country and didn’t know them, if he had done nothing to them. The men hadn’t bothered to put on masks and each one had a gun in hand. They started to ask him questions, of which he didn’t understand a single one, he tried to explain to them in some way that he didn’t speak their language and they seemed to understand him, as one of them went down and quickly returned with a fifth man, who looked much better. The fifth man was now the one who spoke to him and only he spoke. He spoke English fluently, which for some reason didn’t surprise the foreigner. He started by explaining the situation to him, he found himself in one of the most dangerous barrios in the country, which he would not get out of unless he cooperated. The man seemed to know everything about him, his name, his personal details, his country of origin and even information about his family far from here. He held a telephone up to him and asked him to ring his family back home, once he had done that he would need to ask them to transfer a certain number of dollars to a bank account, they would have only twelve hours to do so or they would kill him. The foreigner knew that the amount was little short of impossible. Night fell, the sun stopped lighting the orange mountain and slowly all of the lightbulbs were turned on revealing those white and yellow lights that once filled him with wonder. There were only two hours left until the established time limit ran out, two hours to see if he would die, he felt strangely calm. A few houses below, they were having a party and the typical music of the region mixed with shouts and laughs, now and then shots could be heard that didn’t seem to have an owner, nor origin, nor destination. Despite everything, his captors had not treated him badly, they were professional, they had brought him food and had untied him as they knew he wasn’t going anywhere. As the hour drew nearer, he asked the fifth man for a cigarette and asked him, given that he was only one who spoke English (and the only one not to show hatred on his face), to sit and chat with him for a while. The man agreed. They spoke about football and politics in which the man was strangely opposed to the current regime too. Soon fireworks started to explode, surely those left over from the 31st. The foreigner observed the beauty of the lights serenely while he smoked his cigarette and chatted with his captor. The boy was still contemplating the lights, removed from every reality of his life, removed from the day and everything it brought with it, he was somewhere else, in his own world in which words like assassination or kidnapping didn’t exist, he was in the world that every boy should grow up in. He stayed there all night, playing and imagining fantastical situations of his own creations which came to life in this world, in the universe of lights. He didn’t know when he fell asleep, but he felt his father’s arms picking him up and tenderly carrying him to bed. He was neither asleep nor awake, but in that limbo where we are not part of either world, or rather we are part of both. With his eyes half open, he watched his father’s silhouette and listened to the hum of the conversation he was having with his mother. He couldn’t make out most of the conversation as this limbo lets us hear but not understand. Slowly images from a new dream came to him, a fantastical dream in which he was driving a ship that would take him to the sun and the moon. He could only glean one thing from the hum: “A foreigner has died”. El niño miraba con asombro y admiración, a lo lejos, las miles de luces blancas (que llegan a parecer más azules que blancas) y amarillas. Desde la terraza de su casa, todas las noches se detenía para observar a las hermosas luces lejanas en la parte más al este de su ciudad. En las luces arrejuntadas de la montaña veía lo que el cielo por la contaminación no podía darle, veía estrellas, constelaciones enormes y desordenadas que conformaban lo que para su joven mente tendría que ser una galaxia. Las luces de la noche le otorgaban la sensación de que la tierra y el espacio se mezclaban y que en ese momento, aunque lejos, él podría ir a otros mundos y explorar el universo. Las luces también le traían lo maravilloso de la navidad, donde todo es adorno y luces, todo es hermoso y su inocencia infantil florece; las luces de la montaña le recordaban a un gigante árbol de navidad. El extranjero que llegaba desde el avión por primera vez a esta tierra desconocida también quedó maravillado con el espectáculo de luces que lo recibía. No sabía mucho de este lugar, no compartía el idioma, ni sabía mucho de su historia. Lo habían mandado por cuestiones de trabajo a que se reuniera con los dirigentes de una corporación cuya sede aún se encontraba acá. El hombre sabía, por cultura general (y también algo de prejuicio) que era un lugar con una gran pobreza, y con una distinción de clases bastante marcada, le habían advertido, además, de los índices de inseguridad, por lo que el extranjero no pudo evitar sentir un poco de miedo por su misión laboral. Pero por la ventana del avión no reparaba en nada de eso, solo veía las luces que cálidamente lo recibían, luces que de ninguna forma podrían hacerle daño. Lo recibió un chofer enviado por la corporación, que debía, sin detenerse, llevarlo al hotel de su hospedaje. Diez minutos de trayecto y el sueño fue ganando territorio. Por el camino de carreteras montañosas divisaba algunas de las luces y, con ojos entreabiertos, las admiraba. Se dejaba embelesar por las maravillosas luces sin pensar en su verdadera naturaleza. El extranjero, que llegaba fatigado de noche, no se imaginaba que las luces en realidad eran sirenas citadinas, que de noche y a lo lejos maravillaban, pero que en su interior habría suficiente terror para una vida. Finalmente habría llegado, era finalmente 31 de diciembre, la noche más esperada del año para el niño de la terraza. Sabía que muchas familias se trasladaban a lugares altos y con buena vista para admirar los fuegos artificiales y las luces de la ciudad, él no tenía que trasladarse. Su casa se encontraba en una de las más altas lomas de la ciudad, vivía en una lujosa quinta de gran tamaño fruto del trabajo de sus padres, desde allí se veía toda la ciudad, todas las luces y todos los fuegos. Cada víspera de año nuevo su familia entera se reunía en su casa, comían, algunos se emborrachaban, algunos bailaban, y al acercarse la medianoche, todos, con copa de champán en mano, se arrejuntaban en la terraza a ver los fuegos y a lanzar unos propios. Su madre siempre lo fastidiaba para que jugara con los demás niños que venían a su casa en la ocasión, primos fastidiosos en su mayoría que siempre querían hacer algo que él no quería. Les encantaba correr y jugar al escondite y a la ere, pero él no era muy bueno en estos juegos, no era muy rápido y a pesar de que era hábil para esconderse, si pasaba mucho tiempo sin que lo descubrieran se asustaba y salía de su cueva, momento en el cual los demás lo divisaban y perdía el juego. Estaba consciente de que era un chico peculiar, pues por su inteligencia había notado que muy pocos eran los que compartían sus intereses y muchos eran los que compartían interés por cosas que le parecían tediosas. Por esta razón el decidió no acatar más a su madre y dejar que sus primos jugasen solos con la condición que lo dejaran en paz mientras él, sentado en su terraza, contemplaba el universo de las estrellas citadinas. El extranjero se despertó con la voz de su chofer que le indicaba que ya habían llegado al hotel. Estaba un poco desconcertado, como si no supiese bien en donde se encontraba, y estaba un poco preocupado por no haberle prestado atención al camino, pero por su cansancio decidió que llegaría directo a la cama y mañana le pediría al chofer que le diese un pequeño tour. Al llegar a su cuarto, lo primero que hizo fue vaciar por completo su maleta. No había traído mucho, ni nada muy importante, la ropa la puso en el closet, trajo consigo unos tres libros que puso en una repisa, su computadora la colocó en el escritorio y los instrumentos de higiene que fueron puestos en el baño. A pesar de que no tardó ni diez minutos haciendo esto, pareció por su cansancio previo, una tarea titánica de la cual salió completamente extenuado. Se tiró a la cama e inmediatamente cayó en la madriguera. Soñó que manejaba una nave espacial muy pequeña, de capacidad para apenas dos personas, pero en el asiento de al lado no había nadie. Volaba viendo infinitas estrellas en toda su periferia que lo asombraban inmensamente. Vio planetas de distintas formas, de distintos colores y proporciones y, mientras tanto, las estrellas a su alrededor no cesaban, cada vez parecían haber más. Luego entró en uno de esos planetas, era verde y azul como el suyo, pero sabía que no era el suyo, era mucho más grande. Paseó por interminables bosques y mares que recorría en apenas segundos en su nave mientras que más y más estrellas aparecían a su entorno, cada vez más cerca. Entró en un mar colosal que no parecía tener fin, vio un centenar de criaturas marítimas que sabía que en su mundo no existían y fue allí que escuchó el hermoso cantar. Una voz sublime de la mujer más bella que había visto, lo llamaba, mientras que las estrellas se acercaban, salió de su nave y caminó por el agua sin dificultades, mientras que las estrellas se acercaban, la mujer cada vez más cerca, pronto la podría agarrar, pronto la podría tener, las estrellas lo quemaban, pero él no lo sentía, pues estaba completamente hechizado por el amor. La tocó, la abrazó y ella le seguía el juego mientras que le seguía cantando, ahora en el oído, pronto le dijo que la besara y acató sin vacilar a la petición. El momento del beso fue sublime, se sintió como un ser atemporal, dueño del cosmos, creador de laberintos infinitos y padre de las estrellas que ya estaban tan cerca que lo abrazaban. Ese momento de un segundo fue eterno, y fue suficiente para no reparar ni darle importancia a lo que pasó después. La mujer lentamente lo fue devorando sin que se diera cuenta, hasta que lo engulló por completo y las estrellas, ya parte de ellos, la consumió a ella y a él adentro de ella, dejando nada salvo la resplandeciente luz y calidez infernal de la estrella cercana. Ahora era él adentro de ella, adentro de la estrella. Se despertó perplejo y ahí mismo sonó el teléfono, una llamada de su chofer. Finalmente era el momento, el niño se encontraba de primero apoyado en la baranda de su terraza, presenciado la belleza de los juegos de fuegos y luces. Fuegos de todos los colores y formas que explotaban creando sonidos retumbantes que lo maravillaban. Lentamente la ciudad se iba llenando de una neblina espesa propiciado por el humo de los cohetes y en este punto el niño por los sonidos y las luces que aparecían detrás de la cortina de neblina, imaginaba que la ciudad estaba siendo invadida, que nos encontrábamos en una guerra y que los invasores habían aprovechado la fiesta del año nuevo para agarrarnos desprevenidos. Este juego lo distraía un buen rato, pero luego volvía a simplemente contemplar todo el espectáculo, un show colectivo en el que participaba todo el universo, cuando desde las luces de la galaxia montañosa del este hasta el otro extremo en el que había otra galaxia, pasando por el centro (que era su ciudad), todos se ponían de acuerdo para lanzar fuegos artificiales y hacerle homenaje a las estrellas intentando imitar su luminosidad y colorido. El niño se dormía con una sensación de paz y felicidad que pocas cosas eran capaz de brindarle. No se podía decir lo mismo de su despertar. Al llegar el día del primero de enero, el niño se desesperaba pues tendría que esperar todo un año para su noche favorita y un año para un niño es poco menos que una infinidad. El día, además, lo traía de vuelta a la realidad, en el día ya no se encontraba mezclada la tierra con el espacio, pues había una gran capa de azul en el camino. En el día desaparecía el mundo lejano de las luces y aparecían casitas de colores y techos de zinc, no sabía como ocurría esto, pero de alguna forma la transición día-noche transformaba todo. En el día, su padre le advertía constantemente sobre estas casitas de ladrillos, hablándole sobre su peligrosidad. Le decían (no solo su padre), que allí se robaba, se secuestraba y se mataba, entre otras cosas. Palabras no hechas para el oído de un niño, pero que infelizmente eran parte de su realidad y tenía que conocerlas para poder evitarlas. Eso traía el día, traía realidad, fría y cruda realidad. El chofer lo vendría a buscar en una hora y media, por lo que tenía tiempo para desayunar y leer un poco. El mesonero al anotar su pedido le trajo el periódico local, del cual el extranjero no entendía ni una palabra, pero antes de poder devolverlo, vio una imagen que le llamó la atención. La primera plana mostraba una foto de una gran panorámica de la ciudad en la que se incluían los barrios de luces, toda bañada de fuegos artificiales. Era de hace unos días la noticia, de la víspera de año nuevo. Le pidió al mesonero que por favor le dijera que decía la noticia y en un inglés machucado el mesonero pudo traducirle el título. “Más de 40 muertos en la víspera de año nuevo”. El extranjero quedó horrorizado y no pudo terminar el desayuno. El chofer lo pasó buscando, hablaba bien inglés, pues la corporación se había asegurado de que se pudiesen comunicar, el extranjero le preguntó sobre la noticia y el chofer le respondió con un aire rutinario que esa es la realidad del país. Dieron un tour por las mejores zonas de la ciudad. Pasaron por zonas comerciales en las que se encuentran las mejores tiendas y los mejores restaurantes. Pasaron por parques y plazas hermosamente hechas en las cuales daría gusto sentarse a leer o a simplemente pensar y contemplar esta bella parte de la ciudad. A la hora de almuerzo el chofer lo llevó a uno de los más famosos restaurantes de la ciudad y por no tener a ningún otro amigo acá el extranjero lo invitó a que comiera junto a él. Hablaron de todo un poco, de fútbol, pues ambos eran fanáticos, cada uno contando las anécdotas, victorias y derrotas del fútbol de su país, luego pasaron a hablar sobre política en las cuales el chofer le contaba de la situación actual del país y el extranjero horrorizado la comparaba con la de su propia patria. En el trayecto de vuelta, el extranjero preguntó por los famosos barrios que contaban con las hermosas luces que lograron hasta invadir sus sueños. El chofer rió al escuchar esto y le respondió que lo mejor es evitarlos. Pararon por un semáforo en rojo, todo acabó rápidamente, no sabe cuando ni como el chofer terminó con una bala en la cabeza, propiciada seguramente por el motorizado que había estado en frente. En un abrir y cerrar de ojos dos hombres lo sujetaban y lo arrastraban con brusquedad hacia algún lugar, él no puso resistencia, simplemente no sabía que ocurría, todo acabó rápidamente, le pusieron algo en la cabeza y todo fue oscuridad. De vuelta a su burbuja, el niño en su casa leía tranquilamente. Por eso de las seis llega su padre muy agitado, directamente a la cocina en donde se prepara un té y llama a su mujer. Le cuenta que ha presenciado en pleno día y en el medio de la avenida León un asesinato y un secuestro, apenas dos carros delante de él. Balbucea algo de cómo este país se está yendo al carajo y otras cosas que el niño no llegó a escuchar y enciende la tele que mostraba lo mismo que todos los días, gente quejándose de las condiciones en que vive, una noticia sobre algún asesinato, una noticia sobre el secuestro de algún extranjero y la molestia de su embajada, las alegaciones de corrupción en contra del gobierno por parte de un grupo opositor y las alegaciones del gobierno contra el grupo opositor. Al niño le enfermaban todos esos programas televisivos, que claramente ningún niño debería ver, no lo dejaban leer y le causaban una terrible angustia además de un zumbido interno que no se explicaba, pero su padre parecía inmune a eso. Cada vez que le decía que por favor apagara la tele o cambiara el canal, su padre le contestaba que él aún era un niño y no entendía nada de lo que pasaba. Entonces el niño empezaba silente su ritual de todas las noches, se escapaba a su terraza y veía como lentamente se fundía toda su realidad y formaba un solo continuo paisaje con el resto del cosmos, en el horizonte podía ver todo lo que fue, es y será. Veía las luces y sabía que esas no tenían nada que ver con las casitas de colores y techos de zinc y concreto en las que ocurrían tan atroces crímenes. El sonido de la tele se iba poco a poco desvaneciendo hasta que desaparecía y de ese mundo enfermo y malévolo ya no quedaba nada, sólo quedaban él y las luces del universo. El extranjero se despertó con un golpe. Se encontraba en el techo de una casa igual a todas las demás que conformaban un mar de casas homogéneas en un cerro que perdió todo el verde hace años. Irónico le pareció que directamente en la línea de su visual, no muy lejos, podía ver una urbanización de lujosos edificios rodeados de una pared alta y con una seguridad fuerte. Esta pared era lo único que separaba a las dos caras de la moneda, limítrofes entre sí. Junto a él se encontraban cuatro hombres que lo miraban con una cara de odio sin igual y se preguntó por qué lo odiaban si nunca lo habían visto antes, si él ni siquiera era de esta país ni los conocía, si él no les había hecho nada. Los hombres no se habían molestado en ponerse máscaras y cada uno tenía una pieza en la mano. Le comenzaron a hacer preguntas, de las cuáles él no entendió ninguna, intentó de alguna manera explicarles que no hablaba su idioma y estos parecieron entenderle, pues uno de ellos bajó y regresó rápidamente con un quinto hombre, éste de mucho mejor aspecto. El quinto hombre era ahora el que le hablaba y solamente él dirigía la palabra. Tenía un manejo fluido del inglés, lo cual por alguna razón no sorprendió al extranjero. Empezó por explicarle su situación, se encontraba en uno de los barrios más peligrosos del país, del cual no saldría a menos que cooperara. El hombre parecía conocer todo sobre él, su nombre, sus datos, el país de su procedencia e incluso datos sobre su familia lejos de acá. Le acercó un teléfono y le pidió que llamara a su familia en el extranjero, una vez hecho esto tendría que pedirles que le transfirieran a un número de cuenta una cierta cantidad de dólares, tendrían apenas doce horas para hacerlo o lo matarían, el extranjero sabía que el monto era poco menos que imposible. Cayó la noche, la luz del sol dejó de iluminar a la montaña naranja y lentamente se fueron prendiendo todos los bombillos que revelaban las luces blancas y amarillas que una vez lo maravillaron. Faltaban apenas dos horas para que el plazo establecido culminara, dos horas para ver si moriría, extrañamente sintió una gran tranquilidad. Algunas casas más abajo una fiesta tenía lugar y la música típica del lugar se mezclaba entre gritos y risas, de vez en cuando se escuchaban disparos que no parecían ni tener dueño, ni origen, ni destino. Sus captores a pesar de todo no lo habían tratado tan mal, eran profesionales, le habían traído comida y lo habían desamarrado ya que sabían que no iría a ningún lado. Al acercarse la hora, le pidió un cigarro al quinto hombre y le pidió que, en vista de que era el único que hablaba inglés (y el único que no mostraba odio en su cara) se sentara a charlar con él un rato, el hombre accedió. Hablaron de fútbol y de política en la que el hombre extrañamente también estaba en contra del régimen actual. De pronto comenzaron a estallar fuegos artificiales, seguramente de los que habrían sobrado de la noche del 31, el extranjero observó con serenidad la belleza de las luces mientras se fumaba el cigarro y charlaba con su captor. El niño seguía contemplando las luces, alejado de toda la realidad de su vida, alejado del día y de todo lo que traía consigo, se encontraba en otro lugar, en su propio mundo en el que no existían palabras como asesinato o secuestro, se encontraba en el mundo en el que todo niño debería crecer. Allí permaneció toda la noche, jugando e imaginando situaciones fantásticas de creaciones propias que tomaban vida en este mundo, en el universo de las luces. No supo el momento en el que cayó dormido, pero sintió los brazos de su padre que lo cargaban y lo llevaban con ternura hacia su cama. No estaba ni dormido ni despierto, se encontraba en ese limbo en el que no somos parte de ninguno de los dos mundos, o mejor dicho en el que somos parte de los dos. Con los ojos abiertos a medias, observaba la silueta de su padre, y con los oídos escuchaba el zumbido de la conversación que tenía con su madre. No pudo entender casi nada de dicha conversación ya que este limbo nos permite escuchar, pero no nos dota con la habilidad de comprender, lentamente se le venían las imágenes de un sueño nuevo, un sueño fantástico en el que se encontraba piloteando una nave que lo llevaría a la luna y al sol. Solo pudo recopilar del zumbido una cosa. <<Un extranjero ha muerto>>. Ser admirador es adorar, crear fetiches de cada objeto, leer con la meticulosidad del amante que relee una carta de su pareja. To be a fan is to worship, to turn each object into a fetish, to read as meticulously as a lover rereading a letter from a partner. 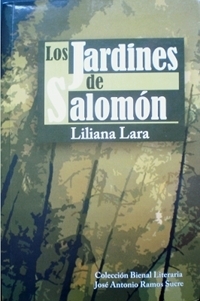 Obsession is the theme running through Liliana Lara’s first collection of short stories, Los Jardines de Salomón (Universidad de Oriente, 2008). From Ernest Hemingway and the French language to spanking or Nina Hagen performing almost naked on Miss Venezuela, the obsessions of children, teenagers, teachers and bored business men are brought to life through Liliana’s intimate and confessional writing style, creating an intense and utterly engrossing collection. For foreign readers, Los Jardines de Salomón is also a wonderful geography lesson, portraying parts of Venezuela rarely seen in contemporary literature, like Cumaná, Catia and Maturín. These lesser-known cities chime with the every day dramas depicted in the stories, providing a refreshing change to the tales of Caracas violence that so often reach international readers. ‘Las interesantes anécdotas, los bien delimitados personajes y las excelentes ambientaciones están acompañadas de unos recursos estilísticos impecables’. ‘The interesting anecdotes, well-defined characters and excellent settings are accompanied by some impeccable stylistic devices’. Watch Liliana’s reaction to winning the prize below. ‘Liliana Lara: Una escritora marginal en el mundo’ – discussing Los Jardines de Salomón with Jacqueline Goldberg. Sudaquía recently acquired the rights to Los Jardines de Salomón and will be publishing the book in the United States in 2014. This news story comes from Ficción Breve Venezolano. Read the original story here. Y nos pegamos a la fiesta by Víctor Alarcón is the winner of the 2012 Oswaldo Trejo Short Story Prize organised by Editiorial Equinoccio, the publishing arm of the Universidad Simón Bolívar, following a majority decision by the jury made up of Luis Barrera Linares, Carolina Lozada and Norberto José Olivar. 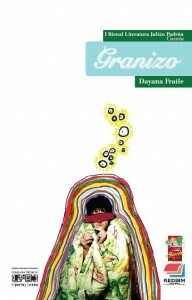 The jury also decided to award special mentions to the short story collections Trampa-jaula by Liliana Lara and Tristicruel by Domingo Michelli Villabla. Barrera Linares and Olivar praised how the five stories of Alarcón’s text are “harmoniously linked” by a narrative voice that uses parody, humour and irony to draw a “very appropriate portrayal of the characters and locations”. The whole jury underlined the “quality, purpose and responsibility” with which the authors of the 42 texts submitted to the competition confronted the key social, cultural, political and fictional preoccupations of contemporary Venezuela. You can read the full verdict here.